We are excited to share that we have been named a top industry leader in Clutch’s latest report on the top B2B companies in Boston. We could not have achieved this level of recognition without the feedback from our clients. With 15 current client reviews and growing, we maintain a rating of 4.9/5 stars. “You’ll find agencies that are good strategically or creatively or that can drive a schedule. 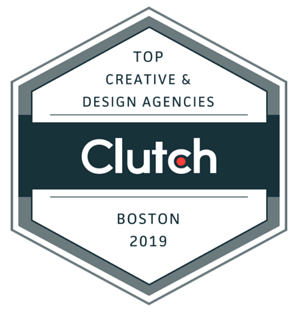 In addition to offering the very best in web design services, Clutch also recognized our deep capabilities and experience in graphic design and branding, ranking us first and third respectively in these categories. As RainCastle’s services are integrated and we describe ourselves as being at “the intersection of branding and web design,” this recognition supports our brand promise. RainCastle’s top Clutch rankings are particularly meaningful because they are based on in-depth client reviews. We appreciate our clients and will continue improving and growing with their support and feedback. We look forward to this recognition and expanded digital presence helping us reach new audiences and providing value for many more clients.